As I look back on the year, it’s been quite a ride. 57,000 kilometres, 61 hotels, 35 flights, 9 countries and 2 major writing awards. 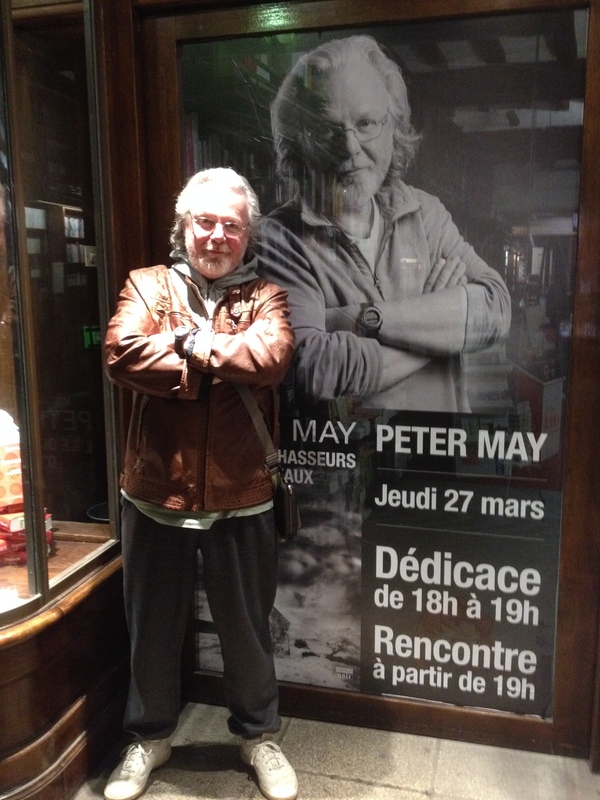 On my return from the UK, I spent a week doing signings and events in Paris bookstores before returning to Spain to resume work on my latest book “Runaway”. In March I went back to Paris for the Paris Book Fair and followed that with a tour of bookstores in North West France. 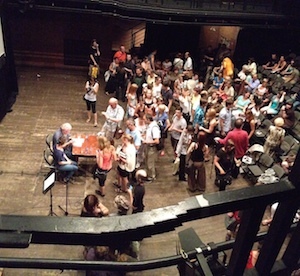 More than 200 people turned out in Brest at the Dialogues bookstore. With the cafe/event space overflowing, they set up video screens to play the interview around the store. People were sitting on staircases and in any available space to watch. In April I got back to the research for the new book, Runaway, which meant driving through the UK retracing the route I had taken in the 1960s from Glasgow, through the Lake District and Leeds to London. After that, in May and June I was in self-imposed exile while I got down to the job of writing the book. 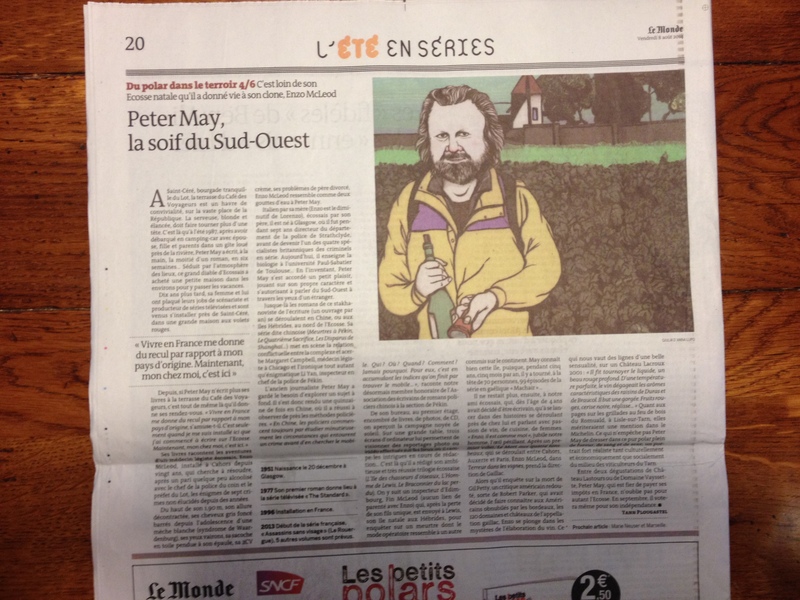 At the beginning of the summer the back page of Le Monde was devoted to a feature about me illustrated by a quite odd drawing! 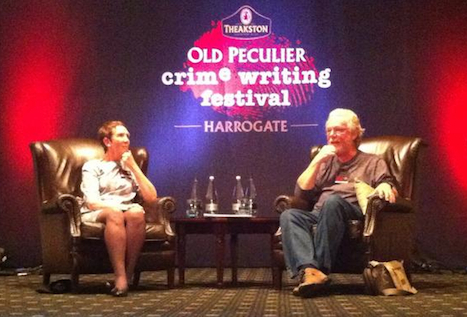 The minute I finished writing the book in July I went back to the UK to the Harrogate Festival of Crime writing. I had been invited to do an event there and the last book in the Lewis Trilogy, “The Chessmen”, had been shortlisted for the Theakstons Old Peculier Crime Writing Award. The day after I returned from Harrogate, it was back to Toulouse airport to start a 3-country tour of Central Europe, taking in the Czech Republic, Slovakia and Poland. We flew in and out of Prague and traveled by rail and car to Brno, Kosice, Ostrava and Wroclaw. We arrived in torrential rain and on the motorway from Prague to Brno, narrowly missed disaster when an entire wheel came flying off a truck in front of us. It bounced 50 feet into the air, then came crashing down and careered along the road towards us. Luckily the motorway was quiet, the driver swerved to avoid it and got us to the theatre where there was a full house waiting to see me! 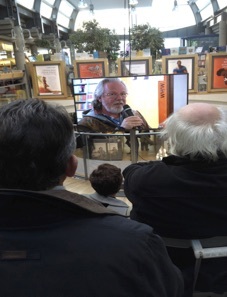 For the public events, I had to read from The Blackhouse while a translation of what I was reading was projected on to a large screen behind me on the stage. The crowds were amazing, and I had no idea how well my books are doing in these countries! The Chessmen was at #2 during October in the Czech Republic. While we were there, a film crew made a documentary about me and I had to indulge some quite peculiar requests. 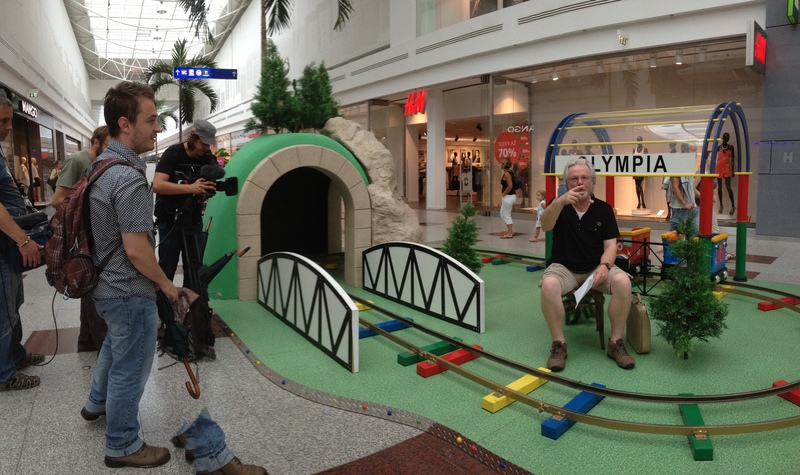 Here I am sitting in a children’s playground in a shopping mall. 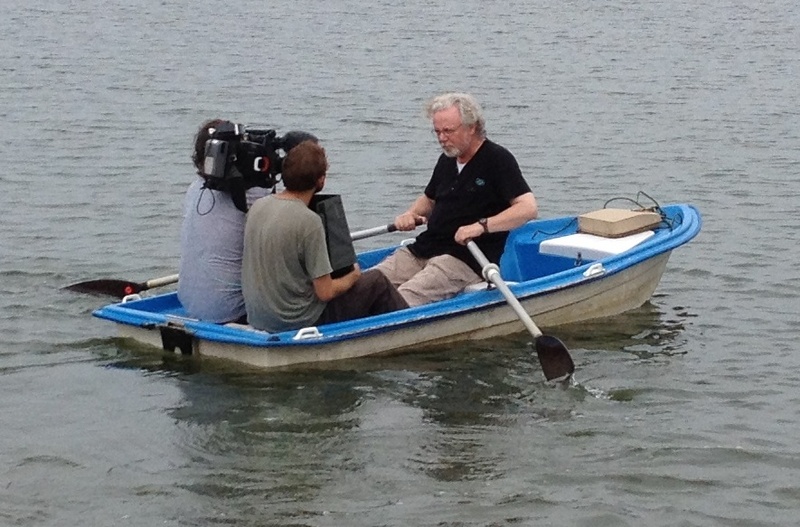 And here… rowing a boat on a lake with the film crew. I’ll be very interested to see the finished film! 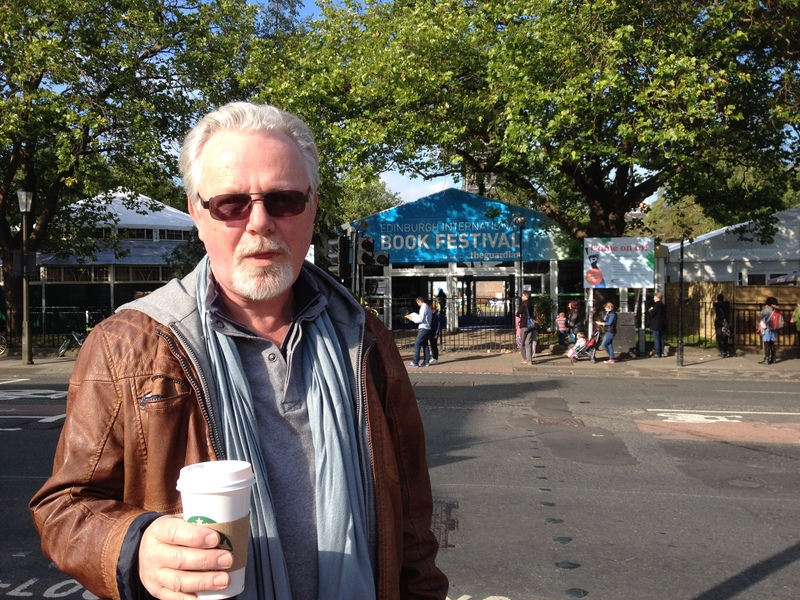 In August, after a trip to Luxembourg, I was invited back to the Edinburgh Book Festival, where I spoke at two events – a reading in the morning, then in the evening I was interviewed by Jenny Brown in front of a sellout audience. Then it was off to the Isle of Lewis for the paperback launch of Entry Island. 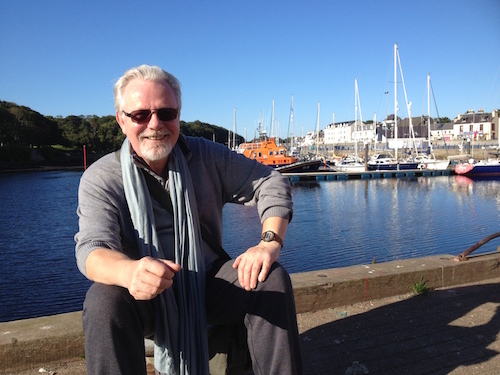 It was great catching up with so many old friends in Stornoway. The launch tour continued as we made our way back via Inverness, Inverurie and Aberdeen to Edinburgh. We spent one night in Edinburgh before flying out to Toronto to start the US/Canada tour. 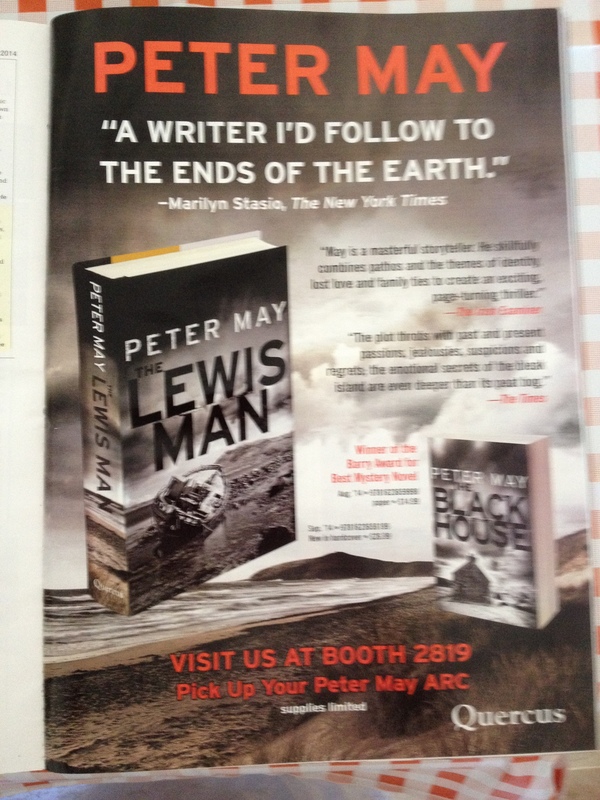 The Blackhouse came out in paperback and The Lewis Man in hardback in September in the USA and Quercus decided I should undertake a tour of the US and Canada. The reviews for the books have been excellent in North America, with “The Blackhouse” winning the Barry Award for Best Crime Novel in 2013; but it’s always hard to get the word out about new books in the USA, it’s such a big, diverse place. Quercus backed the tour up with ads like the one on the right in trade press and the New York Times and the rest was then down to me and word of mouth! We flew into Toronto, then down to New York City before going coast to coast: Boston, Minneapolis, Houston, Denver, Salt Lake City, Sacramento, Los Angeles, Seattle, Winnipeg, and back to Toronto. As well as the bookstore events, I did radio interviews and television. 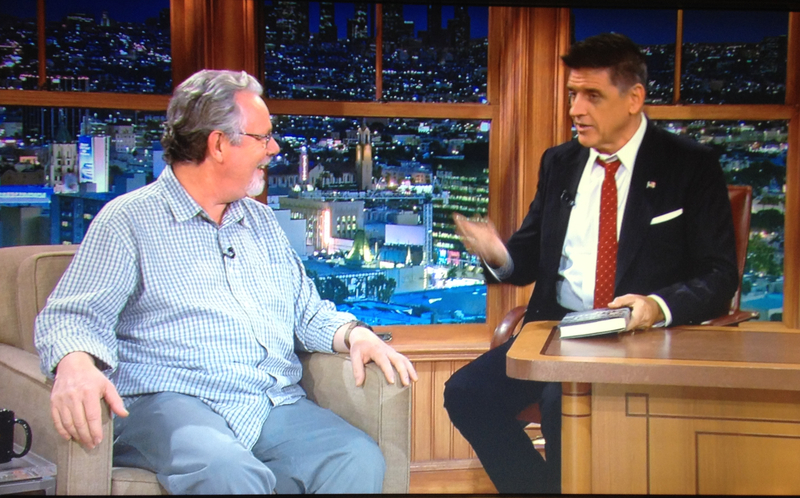 In Los Angeles, I was invited to appear on fellow Scot Craig Ferguson’s Network chat show, the Late Late Show – that was a quite crazy experience! After many long weeks on the road on a trip that took us from our home in France to the Edinburgh Festival, then all around the USA and back across Canada we flew back to Scotland. 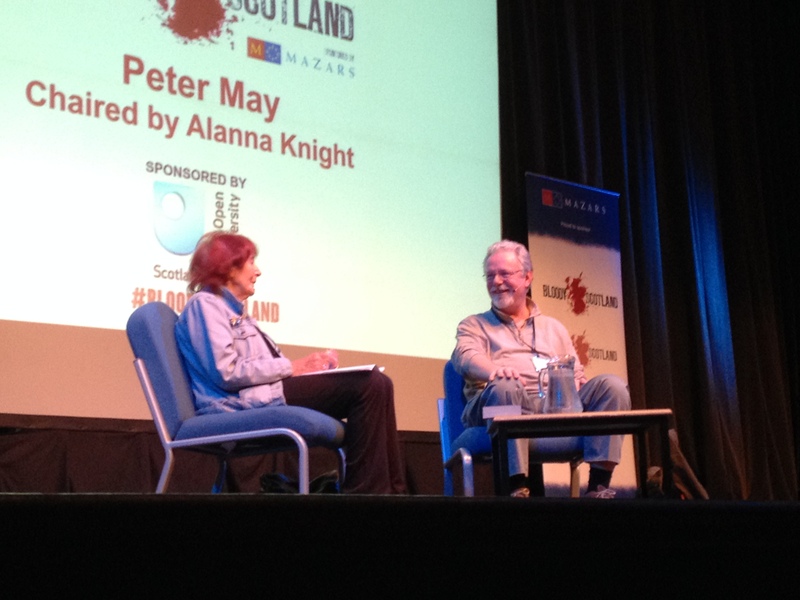 We had one last event to attend before we could get home to France – “Bloody Scotland”, Scotland’s own crime writing festival, held in the fantastic location of Stirling. I was interviewed by my old friend Alanna Knight who recently received an MBE in recognition of her 60-year writing career! 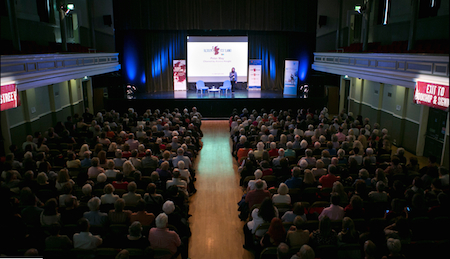 Stirling’s Albert Halls was packed with around 500 people for the event. The festival is always a convivial affair and this year, there was a Scotland Vs England football match. The teams, made up of crime writers, played with great energy. They might have sedentary lifestyles, but they all had the killer instinct. It was a beautiful sunny day, made even better by the fact that Scotland won: 14 – 1! I had been asked to present the trophy (of course there was a trophy, it was a very serious match!) 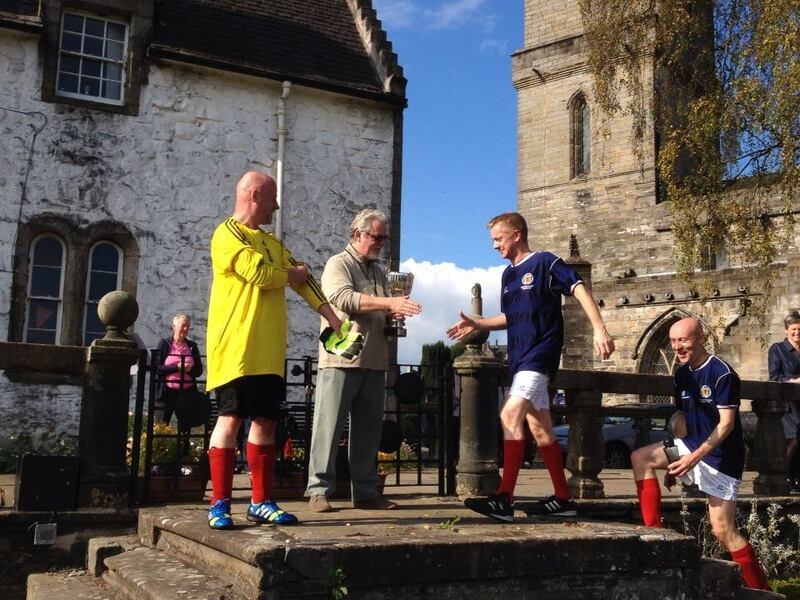 and had great pleasure in handing it over to the Scotland team, captained by Ian Rankin. Later that night, I was the one on the receiving end of an award. 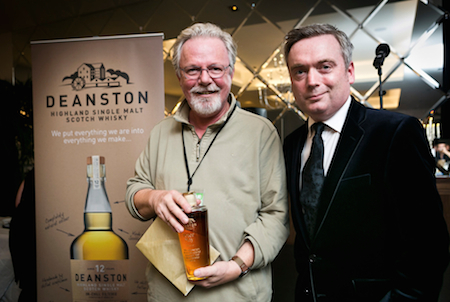 Entry Island won the Deanston Scottish Crime Novel of the Year and I was given an engraved crystal decanter filled with delicious Deanston Single Malt. When we arrived home, the ITV Crime Thriller Book Club was already underway on television. We got back in time to catch the episode featuring “Entry Island”. It was reviewed by Peter James, Kate Mosse, Sophie Hannah, Val McDermid and Mark Billingham. I was knocked out by the kind things they said about it! 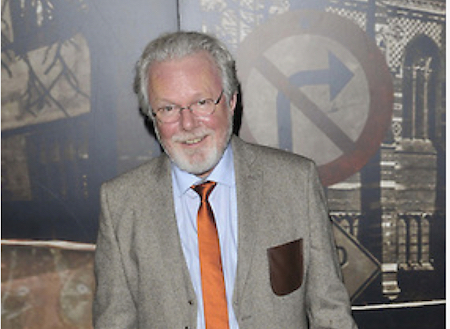 The six books in the book club were in contention for the “Best Read” Dagger Award, at the ITV Crime Thriller Awards ceremony in London at the end of October. My publisher said I had to attend… another flight and hotel room! But the thing that bothered me most was that there was a dress code! Anyone who knows me knows I lean towards a “casual and comfortable” approach to my attire. I don’t even possess a suit. I would normally wear the kilt to special occasions, but after weeks of touring and not being in control of my diet, my kilt was out of the question. I had to rush to our nearest big town, Brive La Gaillard, and throw myself at the mercy of a lovely shop assistant who took great delight in kitting me out from head to toe (including socks and scarf!) in fabulous French style. Mt wife assured me it looked good, but as far as I was concerned, it was a scratchy, constricting, suffocating experience and I wasn’t sure I could stand a whole night of starched shirt, tie and buttoned-up waistcoat. As I was one of the nominees, a limo arrived at our hotel to take us to the Grosvenor House Hotel where the dinner and awards ceremony was being televised. Red carpet and photographers greeted me and I was asked to stop and pose before we went through to the champagne reception and awards dinner. The evening covered crime writing in the form of TV series and films, as well as books, and there were awards for productions and acting as well as writing so there were numerous awards. The wine was flowing, the hours were passing, no-one was allowed to leave as the event was being recorded for television. 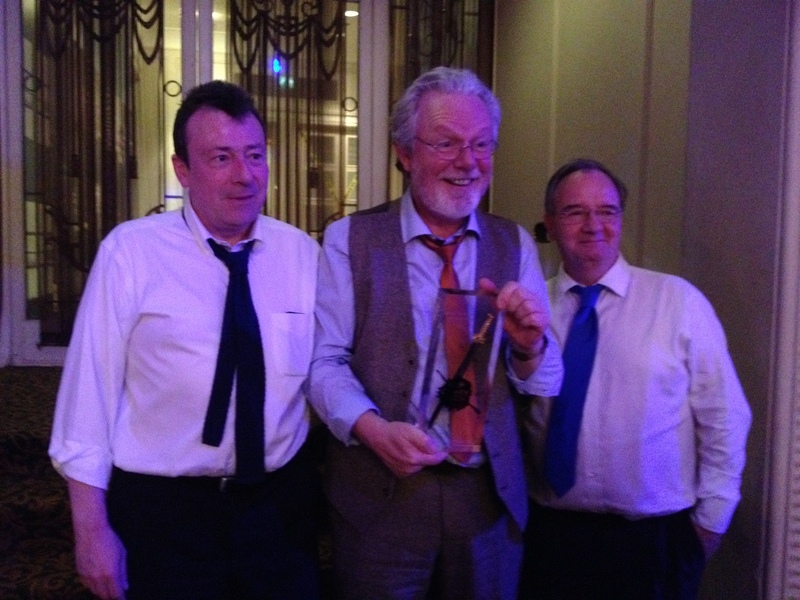 The “Crime Thriller Club Best Read” award was the last one to be presented and to be honest my mind was focused on the moment when it would all be over and a) I could visit the toilets and b) I could get out of the tie and suit. The competition was so strong, I had absolutely no expectations of winning. I was genuinely astonished when I heard my name being called out and the lights and cameras focused on me to follow me to the stage. 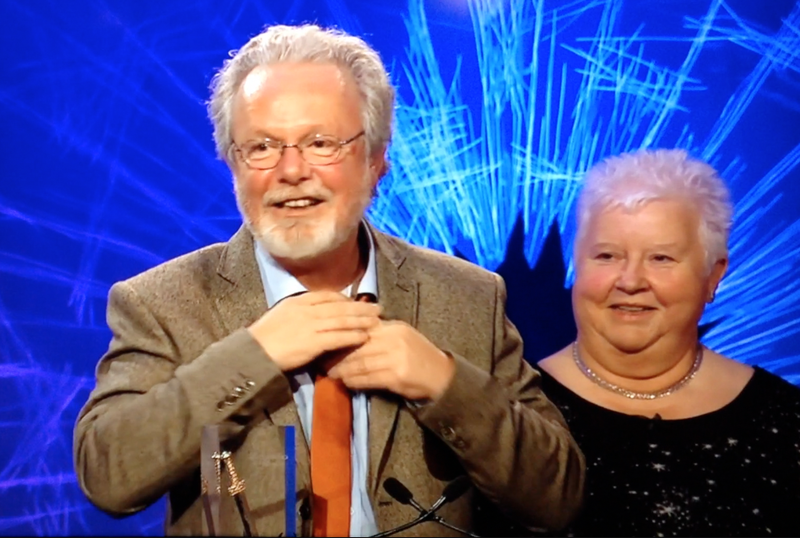 Val McDermid looks on as I try to adjust the tie that’s choking me! 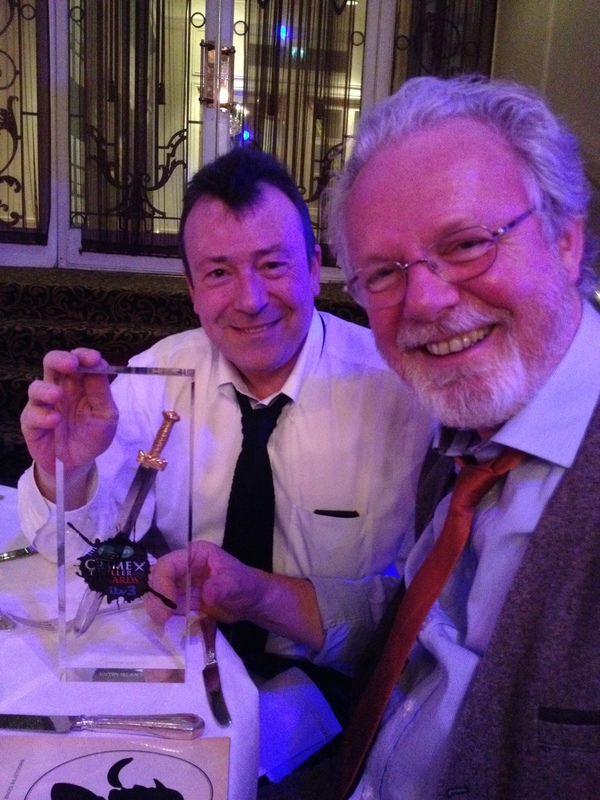 The award really belongs to everyone at Quercus publishing for their support and in particular my editor Jon Riley. “Entry Island” was a risk, combining history, a love story and a crime novel. 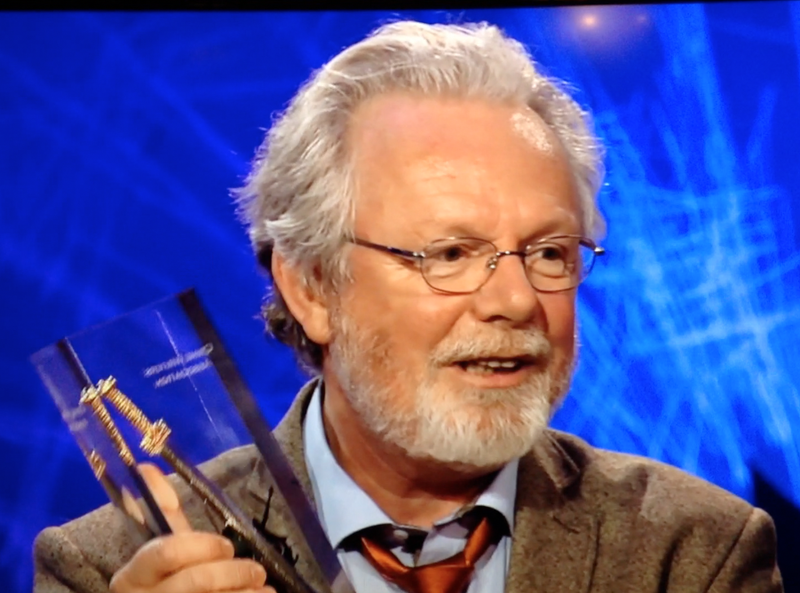 But Jon has backed and encouraged me to push the boundaries with my writing and it has paid off with “Entry Island” winning the Deanston Scottish Crime Novel of the Year, and the ITV Specsavers Crime Thriller Club Best Read of the Year. But the year hasn’t all been about books. In May, my friend from childhood Stephen Penn and I released the music album that we have been working on. 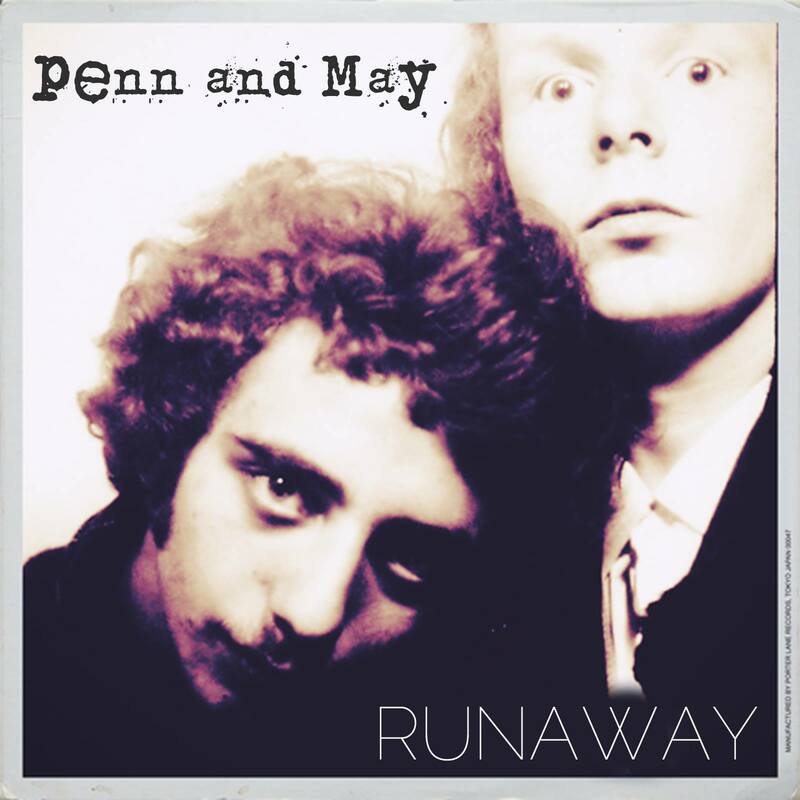 It’s available from various music download sites if you search for “Penn and May” and “Runaway”, you can find it here on iTunes and on other sites such as Amazon. 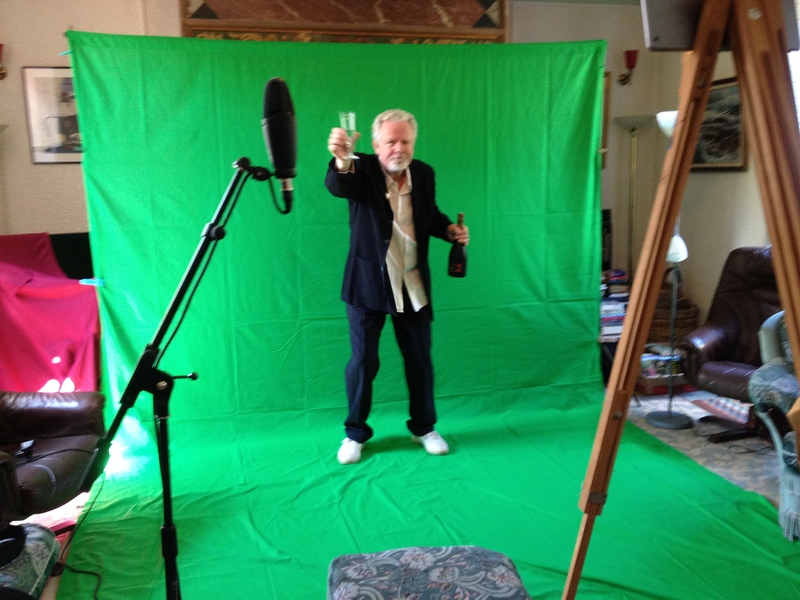 Stephen has been creating brilliant videos to go with the songs on the album. You can see them on Youtube. He even managed to make the videos although we were miles apart by getting me to film myself against a green screen set up in my living room in France and sending them down to his home in Spain where he incorporated it into his productions. In fact, our real-life teenage experiences of playing in a band and running away to London together inspired my latest book. 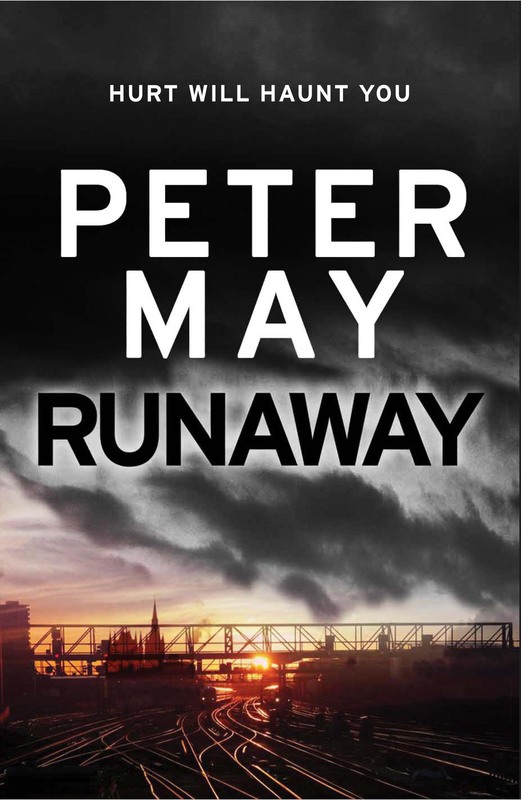 Like the album, it is called Runaway and will be out in hardback in January 2015. You can find out more about the story behind it, here. And you can pre-order the hardback edition of the book, “Runaway” which comes out in the UK on January 15th, Get your copy from The Book Depository and you will receive FREE shipping to anywhere in the world. 20 Responses to 2014 – What a Year! What a journey that has been. Very interesting. More power to your pen! Thanks, Moira. 2015 looks like it’s going to be just as hectic! Happy New Year Peter. Hope all goes well with your new book. can’t wait to read it. Happy New Year Peter – great blog. Can’t wait for ‘Runaway’. The premise sounds completely fascinating and as a music fan, aficionado of sixties culture and lover of the written word – I think you’ve crafted this one for me! Thanks, Chrissie. It was a nod to a good friend and great professional. Delighted you enjoyed it. Interesting year you’ve had. Love love love The Lewis Trilogy and Entry Island. The stories stay with you. Look forward to The Runaway. What a fantastic writer you are! Thank you so much, Carol. Delighted that you are enjoying the books. Well I am incredibly disappointed after finishing your “Lewis” trilogy. And why is that, you might ask? Well, because there are only three books!! I would be very happy if there were more down the road. My disappoint is a sign of a very good author. I should survive in the meantime though, after all, you have written other books. However, please extend the Lewis…..
No more Fin books, I’m afraid, but more with an island setting – then there are others set in France, China, 1960s London…. Plenty to keep you busy! 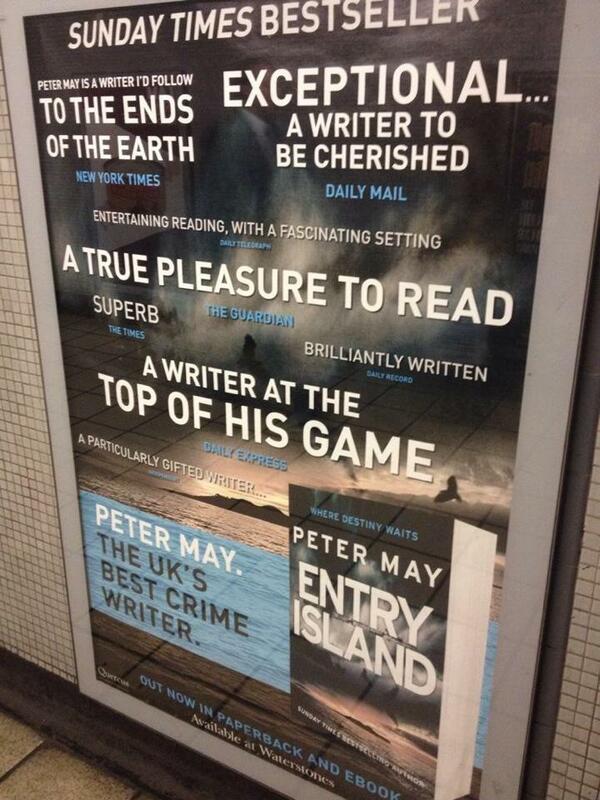 I’ve only read the Lewis trilogy and ‘Entry Island’, but look forward to reading many more. I was wondering, have you taken any inspiration for ‘Entry’ or other books from the writings of Neil Gunn? Some of the themes and writing reminded me of ‘The Silver Darlings’, the most beautiful novel I have ever read. I am writing to you from the US. I am VERY frustrated that I can’t get most of your books on my kindle in the US. I read 4 of your 6 China Series books on my kindle, but the last 2 are not available on kindle! I read your Lewis Trilogy and LOVED IT. I want to get the Enzo series and all your other books on my kindle, but they are not available on kindle in the US. PLEASE ASK YOUR PUBLISHERS TO GET THEIR ACT TOGETHER. Not only is this poor business management, but your readers in the US must be VERY frustrated not to be able to access ALL YOUR BOOKS. I love, love, love your writing and want more!! !